Captain is the incharge of the ship. All department heads including chief engineer report to the Captain. He is responsible for navigation, safety of ship, crew & passengers. He also oversees the management of all departments and ensures that the passengers are satisfied. Staff captain is second in command. He is incharge of deck department. responsible for navigation, maintenance, safety and security. There may be one ot two chief officers onboard cruise ship. He is responsible for navigation, watchkeeping, training of deck officers & cadets. One of them will be bridge manager and other will be safety officer. Navigational watch keeper; (Junior Officer of the Watch); Responsible for administrative, maintenance and training duties as directed by the Bridge Manager. They are consideredc as trainee deck officers. They assist deck officers as instructed by bridge manager. The Compliance Officer will manage and improve the shipboard injury prevention programs, OPP and USPH compliance. The Compliance Officer will also, establish a safe shipboard environment, while providing active monitoring and analysis for injury and outbreak related incidents on board the vessels. Bosun is incharge of all deck ratings. He supervises maintenmance of the ship as instructed by Chief officer and staff captain. He also assists moorings on arrival and departure port ar while at anchor. AB helsman steer the ship on arrival and departure, do watch keeping duties. AB deck do maintenance mostly on day duty. 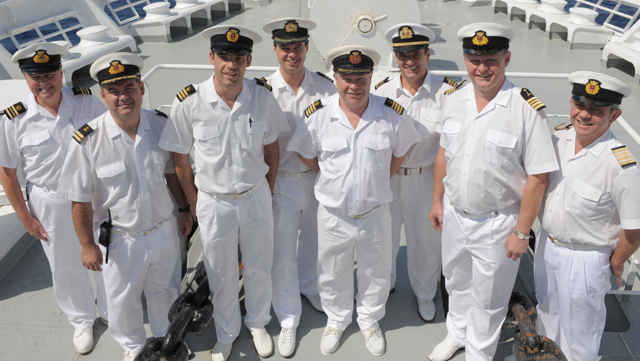 Deck petty officer is responsible for maintenance of life saving and fire fighting equipments. Chief Engineer in incharge of technical department. Staff chief engineewr, head of electrical, hotel maintenance and HVAC departments report to Chief Engineer. As the Staff Chief Engineer, you will serve as the Chief Engineer’s principal assistant in all matters regarding the operation, maintenance and administration of the Engineering Division. Under the direction of the Chief Engineer assigns, directs, and supervises the daily work and watch standing of the Engineers in the Department. As the 3rd Engineer, you will serve as the Junior Watch Keeper and work side by side with the 1st Engineer to assist with all aspects of technical operations and maintenance. Although this is an entry-level position, it is an important role that serves as a great learning opportunity. As the Electrical Engineer, you will serve an important role in maintaining and repairing electrical installations as directed by the Chief Electrical Engineer. The Chief Refrigeration Engineer is responsible for the operation, maintenance, and repair of all HVAC/R equipment and spaces. The Refrigeration Engineer is an important role in ensuring the smooth operation of our ships. As the Refrigeration Engineer, you will be responsible for preparing and executing the required maintenance and operation of the HVAC and refrigeration systems under the direction of the Chief Refrigeration Engineer. This particular position is a floating par to allow exposure aboard vessel classes without a 1st Refrigeration Engineer par on board. As the Hotel Maintenance Manager, you will lead a team of skilled maintenance personnel to repair and maintain plumbing, recreational water features, galley & laundry equipment, in addition to interior décor such as floor & wall coverings, soft goods, and artistic elements of the resort. This role also requires the maintenance of technical systems within both the Hotel and Crew areas, as well as refurbishment of all public and crew spaces to the highest standard. You will be working closely with the Hotel Leadership team and reporting to the Chief Engineer and the Hotel Director.